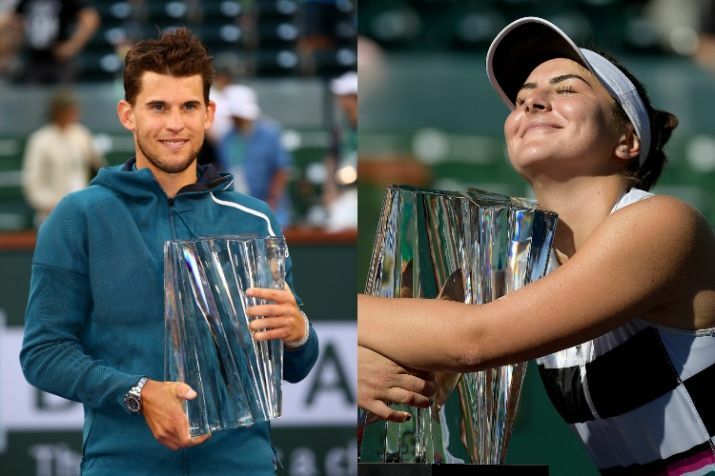 Defying the predictions of many observers (including yours truly) Bianca Andreescu and Dominc Thiem won the women's and men's championships at the BNP Paribas Open in Indian Wells on Sunday. Andreescu received a wildcard into the event, becoming the first wildcard to win the title and the youngest player since Serena Williams won it at age 17 in 1999. Andreescu beat 3-time major champion Angie Kerber 4-6 6-3 6-4 in a very compelling contest which was decided by the 18-year-old Canadian's power and determination to win against her opponents guile, stamina and defense. In the men's championship, Roger Federer won the first set and looked to be extending his streak of winning finals after having won the first set from 20 to 21 when Thiem raised his intensity and the power of his strokes to simply overpower the 100-time ATP singles champion. The 25-year-old Austrian was the tour leader in 2018 with the average speed of his groundstrokes on both wings (depsite a one-handed backhand) and in the final with Federer he exceeded his 2018 average in the match. The final score was 3-6 6-3 7-5. At 4-5 30-30 Federer came within 2 points of his 101st title when he approached the net on a good, deep cross-court approach shot only to find Thiem blasting a backhand directly at him which was too much to handle. A quick service winner later and Federer was unable to hold his serve at 5-all, getting his service broken and allowing Thim to serve out the championship with little hesitation. Both youngsters came from behind in the match to win their biggest titles of their career. Of the two, Andreescu's was the more surprising result. Thiem has been known as a clay-court specialist, having reached (and lost) two Masters 1000 finals in Madrid and the 2018 Roland Garros final but with a signature win over Federer (playing in his 9th Indian Wells final) on a hard court, Thiem showed he is developing into an all-court player. Andreescu was playing in only her second WTA tour-level final and career earnings of $300,000; she earned $1.3 million on Sunday. There were echoes of last year when now World #1 Naomi Osaka was unseeded and won her first career title and then went on to win two consecutive hardcourt majors.